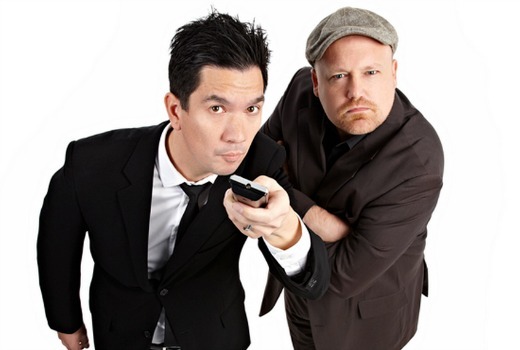 Former Channel 31 presenters Darren Chau and Brose Avard have been given a slot for a late night chat show on ONE. The duo, who produced C31 Melbourne’s first nightly live daily shows, will host Darren & Brose, a half-hour late-night comedy chat series from early July. Combining celebrity chat, sketches, parodies, pranks and music the first episode will feature Julia Morris, Denise Drysdale, Stefan Dennis, David Reyne, Dave O’Neil, Lawrence Leung and an Aussie sporting anthem from Mike Brady. Upcoming guests include Max Walker, Brian Mannix, Steve Moneghetti, Sam Pang and even Dickie Knee. “We want to give people a laugh to end their day and there’s not much we won’t do. We even crashed a 1500-seat event and arrested innocent people for crimes against fashion,” said Darren Chau (pictured, left). The show marks one of the few times a multichannel has backed a late-night chat show, with GO’s The Darren Sanders Show ending in January. Darren & Brose also represents another case of Community Television talent moving to Free to Air. While the sector puts pressure on Communications Minister Malcolm Turnbull to extend their deadline to move online, they acknowledge the training ground they have provided for Logie-winning acts such as Hamish and Andy and Rove McManus. Darren & Brose premieres 11pm Thursday, July 2nd on ONE. Checkout thestreamlive.com.au Australia’s only current late night talk show.. 🙂 wednesday nights at 10pm and anytime online. Shot 2 years ago from memory. Are they making new content ad well or just airing old stuff? Is this show ‘new’ new, or just ‘new’ to Ten as a repackaged cut of their old show? There’s a hint of past tense about the way they’re talking, like it’s in the can already. I have asked. I’m advised the bulk of the show is studio with new guests. There will be some archival sketches included initially as it’s a shoestring budget, and I understand a fairly short lead-in time too. Will these guys be the last to be given a leg-up to FTA from Community TV after Turnbull banishes CTV to the internets? Great TEN puts on a chat show! But why they put it on so late? Awesome news. I worked with these guys back in my uni days where they gave me an opportunity to learn about TV and it was the most fun I’ve ever had. These guys deserve this big opportunity and I encourage everyone to check this out, it’s what Australian comedy and TV needs. Also some of you might recognise Brose from the recent Matador BBQ ads over summer! Good on you boys! A fairly of sterling chaps with talent to burn. More power to you!